The revolutionary debugging extension which complements Visual Studio and supercharges the C# debugging experience! OzCode is a must have Visual Studio Extension which cuts down on debugging time and increases productivity by detecting and isolating bugs, making them easy to fix. OzCode turns C# debugging into a simple, efficient, and even fun experience! How is the OzCode debugger different from the Visual Studio debugger? OzCode integrates with the Visual Studio debugger, and expands on its functionality. Among other features, OzCode predicts the future of a function code execution and provides insights that enable fast problems solving. OzCode allows to search for properties, compare objects, evaluate expressions and create tracepoints - all leading to a fast and productive debugging session. What versions of Visual Studio does OzCode support? I LOVE ReSharper! How is OzCode different, and do they work together? 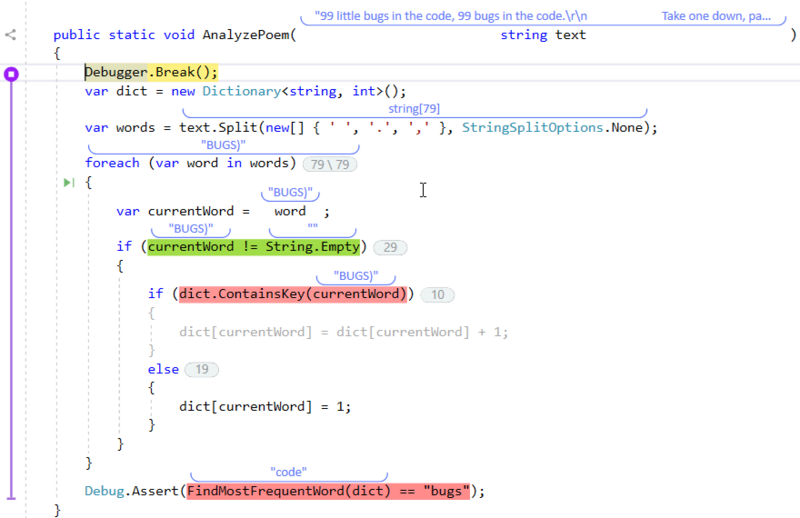 OzCode does to debugging what ReSharper does to coding, and they work seamlessly together. Studies have shown that developers spend about 50% of their time on debugging. OzCode significantly reduces this time, and makes sure developers remain focused on development – what they do best. LINQ is awesome. It allows us to write powerful, succinct, and expressive code that’s a pleasure to read and maintain. The only problem is that using LINQ means sacrificing the debuggability of your code for its readability. If you F10 over a line of code that's using LINQ - you've just performed a whole bunch of complicated logic, but you get absolutely no insight into what actually happened. When debugging LINQ, using breakpoints and manual stepping can be a futile waste of time. OzCode's groundbreaking LINQ debugging visualizations allows you to see exactly how the different items passed through the LINQ pipeline, and see the return value of each and every lambda expression, all while leveraging powerful OzCode tools such as Reveal and Search. With Export, a developer can "grab" objects and save them as either JSON, XML or even as a C# code that can be used to create Unit Tests with the values of the last debug run. Once the exported instance is saved (or copied to the clipboard), it can be used to reproduce the instance state, analyzed or compared using external diff tools. For the JSON output, OzCode uses the industry-standard Newtonsoft Json.NET serializer, which makes it super easy to deserialize and work with the result. Debugging complex expressions is never easy. How do you see what was returned by a method call? What did each boolean condition evaluate to in a long convoluted if statement? Without simplifying the code or adding variables to store individual results, answering these questions is difficult. With OzCode’s powerful “Simplify” visualization, you can instantly figure out exactly what is happening in your code! When stepping over an expression, a red/green color coding will tell you exactly which expressions returned false/true, respectively. The red or green indicate the result of the entire expression. The nicest thing about Simplify is that you can see a historical view of your code’s execution. 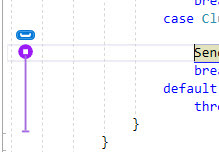 Each time you Step Over (F10) a line of code, a new Simplify button will appear, allowing you to look into the past! No longer will you have to restart debugging if you’ve Stepped Over too far! If you’re a keyboard person, we’ve made some useful shortcuts for you to time travel without lifting your palms: Hit + to visualize the current line and then use + to visualize the current line or + to navigate between the different lines of code.You can also hold down the key while debugging and then tap a digit - to directly pick the statement to visualize. Without OzCode, investigating an exception is a dreary task - navigating through a trail of inner exceptions, scrolling through lengthy callstacks, and squinting through the exception’s associated data to try to make sense of the error. With OzCode, all the relevant information about the exception is presented in a handy tool-window. You can navigate through each inner-exception with a super- convenient breadcrumb control, and even launch a Google or stackoverflow search right from within Visual Studio! OzCode’s predictive exception analysis makes it super-easy to fix an exception before it even happens, with the powerful of Edit & Continue! When you’re debugging a tough problem, especially in debugging legacy code or a heavily multi-threaded scenario, stepping through the code to figure out what the system is doing feels like trying to juggle 12 balls in your head at once. With OzCode, when things get hairy, you can easily add dynamic logging on-the-fly at key points during the program’s execution, and then view the output using the fully featured integrated log-viewer that OzCode bakes into Visual Studio. No longer do you need to stop debugging, add logging code and then rebuild each time you want to add a simple trace! Simply use the “Create Tracepoint” command on the value you want to trace. A Tracepoint is just like a Breakpoint, except that instead of breaking the program’s execution, it writes a trace message. In many projects you can’t start a debugging session by just hitting F5. Instead, you have to use the “Attach to Process” option, find the correct process in the long list of processes, and finally connect to it. Later on, when you restart your debugging session, you have to do it all over again. And again. And again. When you want to compare files, you use a diff application to spot the differences. Unfortunately, when you need to compare two (or more) objects, you have to trust your eyes and memory. With our Compare feature, you can now spend less time squinting, and let OzCode Compare objects and collections with a simple click! The results are displayed in a side-by-side view that helps you investigate the differences and the similarities between the two objects. Once an object is selected for comparison, OzCode will highlight all other local variables and fields that are comparable to the selected instance (meaning they are the same type or derive from the same type). What if you need to spot the difference between two or more items in the same collection? OzCode's Compare makes comparing multiple items simple and fast. Comparing several items in the same collection is easy and the results are shown side by side. When comparing two long strings - such as two XML or Json documents, Compare will automatically launch your favorite Diff tool, making it super easy to spot the difference between the two. You can configure Compare to use either Visual Studio's native diff tool, or an external diff tool, under OzCode->Options. The hardest bugs to solve are the ones that involve mysterious side effects. Consider a long and complicated method which takes an object and performs various mutations on it. Would you be able to tell what has actually changed? For a class with many members, which might also contain a few members themselves, finding the differences is difficult. With Compare you can now save an object’s state and later compare the object, during debugging, to its original saved state. After the function executes, you can choose the Compare to Snapshot option to see the differences. When debugging, sometimes the information you need is not contained in the fields and properties of an object; rather, it’s a calculation or an expression that is based on your object. You might find yourself wishing you had a different set of properties just for this specific debugging session. For example, when you’re looking at a Player object in your game, you might like to see the distance from the nearest enemy without having to add such a property to its interface. For example, if a Customer class has a salary history among its properties, but what you really need to see in order to fix a bug is the customer’s due taxes for a certain year, simply use the “Add Custom Expression” option on the Customer variable, and write the expression that you’d like to see. The expression will be displayed as a property of the Customer class, containing the value of the expression.